November is my birthday month and I’m starting my new year in glorious COURAGE. The word and its energy came to me about a month ago and I knew that my new year will be COURAGE. A couple of years ago I started a practice of creating an intention mandala to support me on my journey towards wholeness and transformation, and I named my year. I learned this practice from a course I took with Janet Conner, The Lotus and the Lili. My first year was BREAKOUT. I really didn’t know what I was doing and I think I chose that name rather than the name choosing me. But regardless, it did turn out to be a breakout year that set me on a new course and started a deeper transformation within me. During that year (and still doing) I removed rocks that were blocking me. I tore down walls that I had erected since childhood. I recognized the inner judges and naysayers. I dug deep within and pulled out weeds that were blocking the new seeds I was planting for a higher spiritual awareness. With each removal of every rock, pebble, judge and wall another layer of fear was gone and I got closer to my true self, the ME I had hidden away all those years ago. WRITE came to me for my second year out of the blue. I would have never picked that on my own, and once that energy attached itself to me, it didn’t let me go. I knew that write was the intention for my second year of my journey towards living a deeper more authentic life and I created my write mandala. Although I didn’t really publish much this past year, I have grown in my creative writing, in my ability to express from my heart and not my mind. I have opened a new door into writing raw and stepped over a new threshold. So WRITE was the energy that carried me for this entire past year. Now for this new year COURAGE showed up. From the very first moment that energy appeared, I have felt a shift in consciousness, a change within me. And a freedom that is new to me. I feel that I have cleared the way and am stepping into my sacred power to live the life I am meant to live. To give the gifts I came here to give. I am still sorting this out and as courage reveals more of itself, other energies are attaching themselves to me and making themselves known. These are all energies that will be a part of my new exciting year ahead. I haven’t finished my mandala yet, but it definitely is making itself present and known. The energy the words carry within themselves are becoming a part of the journey I am meeting in this New Year. I hold out my heart to COURAGE and all the hope that it brings with it. Committing to the energies that have started to unfold within me. Moving into a deeper level of awareness and connection with the All. I thank you for reading my blog and I welcome your comments. How wonderful to have found your new year’s intention. 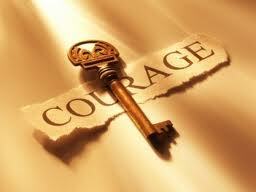 Your diligence and growth has led you to courage. May you dance in its fields with grace and ease. May you find only happiness and joy during your travel Full circle around the sun. You are fearless, limitless, unstoppable. You are courage! Blessings on the journey. Karen, thank you for your inspiring words. Well done Masha. I’ve loved watching you blossom over the last couple of years. You’ll have a wonderful year ahead – I know it. Happy birthday and wishes for a courageous and enlightening journey in the coming year. I’m intrigued by the mandala you described and am inspired to create one of my own. I’m looking forward to following your exeriences and insights. Go forward with COURAGE and enjoy the journey. Lori, I feel honored that I have inspired you to create a mandala of your own. It is my passion that through my own experiences I can encourage, uplift and inspire others to ignite that spark within themselves that opens the door to their own Divine life.